Welp… the best month of the year is over…. wahhhh! Of course Christmas stuff as been in stores for a month now and Thanksgiving is creeping up. So you know what that means… CHAOS. 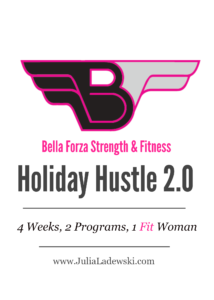 Few years back, I created a Holiday Hustle program, designed for the busy person to stay in shape between Thanksgiving and Christmas. Because while it’s “the most wonderful time of the year” it can also be the most stressful. One in which we run around like crazy persons, from work functions to shopping, forgetting about our own needs. We set resolutions, which only last about 14 days. We fall off the wagon, and that wagon seems to drag us for months and maybe even years. That’s why every year I try to provide my readers, followers and clients with something that will keep them going. Instead of using January 1st as an excuse to let things go from November to December, I want you to have something that makes January 1st that much easier. This year I created a program that is complete with strength/gym workouts along with some quick, intense conditioning workouts. All the components you need to stay strong, stay fit and get out some stress! As a BONUS, you’ll receive the original Holiday Hustle program. Version 1 is a month of workouts, mostly bodyweight and can be done anywhere. Why am I including this? Maybe you don’t have access to a gym every day. Maybe you need something that can be done in 15 minutes at home. Maybe you’re traveling a bunch and need options. Whatever the case is, you’ll now have 2 months of workouts to get you through the holidays… whatever your needs!! From now until Nov. 13th, these 2 programs will come bundled together for $39. After that, the price will go up. Do NOT let these 2 months pass you by…..